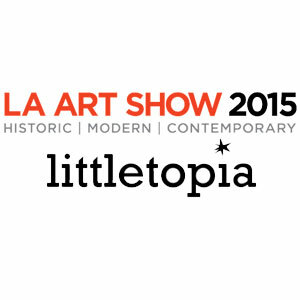 Littletopia Curated by Red Truck Gallery will be at The LA Art Show from January 15 – 18, 2015 concurrently with the Los Angeles Jewelry & Antique Show at the Los Angeles Convention Center, South Hall 1201 Figueroa Street, Los Angeles, CA 90015. For additional information about the Los Angeles Art Show, to register for lectures & book-signings or purchase online tickets, please visit www.laartshow.com. For 20 years The LA Art Show has delivered the broadest spectrum of art from across the globe to Los Angeles’ diverse and engaged collector base. The Los Angeles Art Show, created by KR Martindale Show Management and FADA, is the longest running venue for contemporary, modern, historic and traditional art in the country.